Delineate the primary risks inherent in the design and construction of floor, wall, and roof systems in light frame wood single-family and low-rise multifamily construction. Evaluate the pros and cons of existing construction solutions to mitigate these risks and enhance the health and welfare of building occupants. Discuss potential failures associated with traditional floor, wall, and roof systems. Define a best practice approach to mitigate risk during the product specification and selection process for the purpose of building safe and sustainable dwellings. Things have changed in the housing industry. Traditionally, the American dream meant 2.3 children per household, suburban living, and driving to work. Then came the economic downturn from 2005 to 2010. With the loss of jobs and a soaring number of foreclosures, the homebuilding industry collapsed and the landscape changed for homeownership. Many traditional homeowners quickly became renters out of economic necessity.1 This growing number of renters created a shift in demand from single family to multifamily dwellings. Traditional single-family dwellings created risk for one family, one builder. One family assumed the risk for the entire property with a traditional mortgage. One builder was responsible for failures in design and construction. The shift to multifamily construction has magnified these risks exponentially. Today the risks involve hundreds of millions of dollars and affect thousands of lives, and are shouldered almost exclusively by the developers and their designers and builders. These risks are exacerbated by the state of the construction industry. The Great Recession and subsequent downturn in the construction industry led to a shortage of skilled labor. The Associated General Contractors of America estimates that a majority of the 2 million construction workers who lost their jobs during the recession have either retired or found work in other industries.1 Yet today's less experienced workforce is still required to build very sophisticated building envelopes with increasingly complex core structural elements. In addition, cost-conscious developers are influencing contractors to focus on speed and quantity of work finished, to the detriment of quality and attention to detail, making for a higher probability of installation failure. 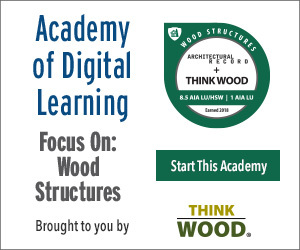 This article will discuss three primary risks inherent in building a light wood frame structure that meets the demands of today's buyer, both in small-scale single-family homes and large-scale multifamily dwellings. Risk mitigation will be explored from the standpoint of the three main elements of the building envelope—floors, walls, and roofs. Various solutions will be comparatively assessed, incompatibilities between systems addressed, and a best practice approach that utilizes high-performance panels proposed. Photo © 2012 Huber Engineered Woods LLC. Photo used with permission of Huber Engineered Woods LLC. 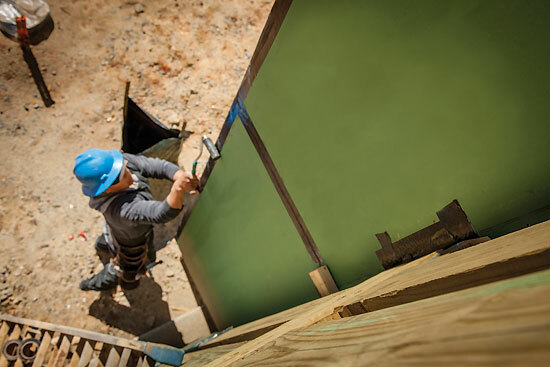 Exterior sheathing panels with an integrated weather-resistant barrier and taped seams minimize risk by eliminating installation steps, streamlining the weatherization process.